You can't always see animals, but you sure can hear them! Crickets, frogs, crows, and many other animals make sounds we can easily hear even when the animals are hiding. 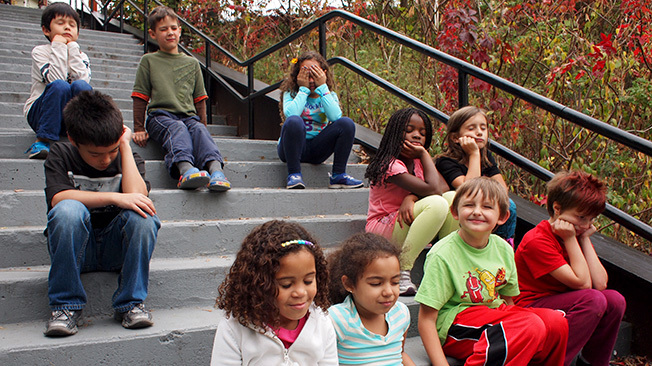 What kinds of sounds - animal and other - will you hear on a walk around your neighborhood? 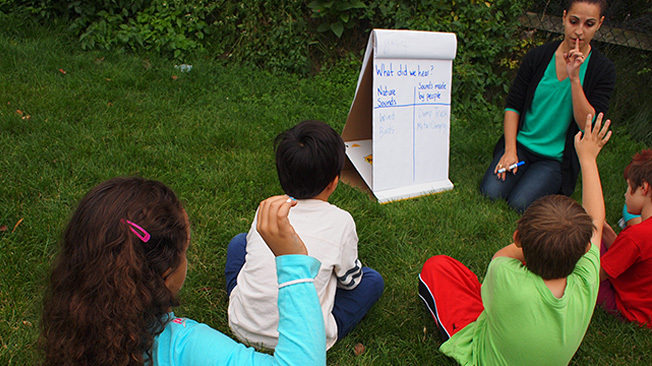 In this listening activity, kids recognize the variety of sounds in different environments, and compare and contrast what they see and hear in two different locations. Sound is one way to tell how many different animals live in an ecosystem. Animals use sounds for different reasons, including to communicate, to warn others, and to scare off predators. Sounds travel differently in different environments. People and animals make sounds using different parts of their bodies. Explore the outdoor environment in advance to note places ideal for kids to sit quietly and listen to the sounds around them. Troubleshoot any safety concerns (sharp objects, poison ivy, car traffic, etc.). Snap your fingers, alternating hands slowly, then quickly. Pat your hands on the tops of your legs quietly. Then pat them faster and harder! Stomp your feet. Stomp them some more. Stomp faster and louder! Pat the tops of your legs loudly, then slower and more quietly. Snap your fingers quickly, then slowly. Rub your fingers together slower and more softly until you can hardly hear the sound anymore. How did that sound like a rainstorm? What words could you use to describe the sounds we made? Tell kids you are about to go on a sound safari, where you will hunt for all the different sounds you can hear in the neighborhood. Before you go out, have kids make some predictions about what they will hear, and jot their ideas down on a piece of poster paper or flipchart. What nature sounds do you think we might hear around our building? What sounds made by people do you think we'll hear? Where should we go in the neighborhood if we want to hear nature sounds? Traffic sounds? Other sounds made by people? Can you name a place where we won't hear any traffic? 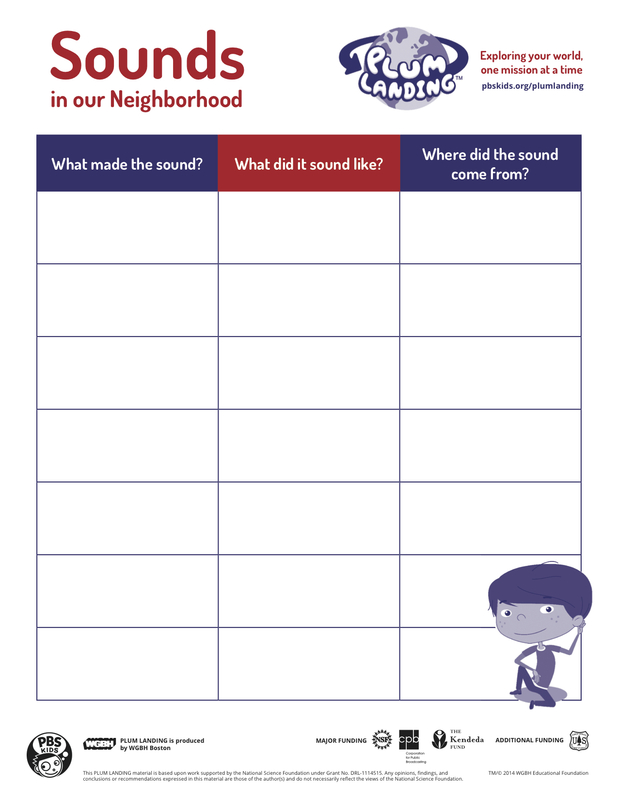 Hand out the "Sounds in our Neighborhood" chart, and ask for a volunteer to read it aloud. What do we need to do as explorers if we want to hear all the nature sounds we can while we are outside? Point out that they will need to be very quiet while they are listening. Alternatively, you might say very loudly, or even yell, "WHAT WILL HAPPEN IF WE ARE REALLY LOUD ON OUR WALK?" or "IF YOU HEAR AN ANIMAL, MAKE SURE YOU YELL SO WE CAN ALL HEAR YOU!" Sometimes telling kids the opposite of what you want them to do allows them to set the expectation by correcting you! 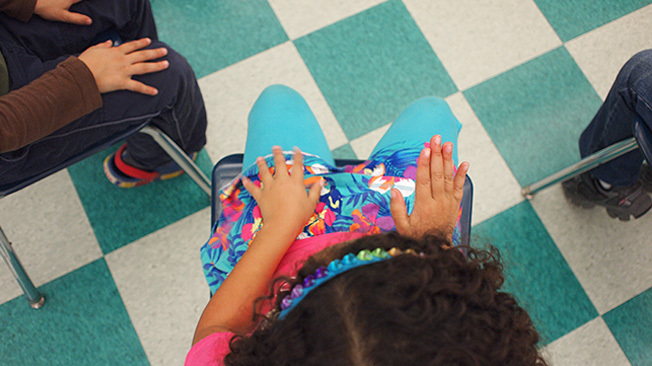 It can sometimes be challenging for kids to sit quietly for a period of time. 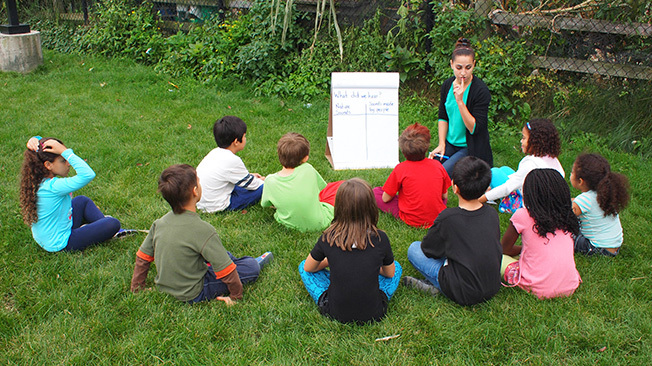 Give them a chance to practice sitting quietly and listening for two minutes before you head outdoors. Start a timer and have kids close their eyes. Tell them that when they think two minutes has passed, they may open their eyes, but they should still remain quiet until you tell them the time is up. Is two minutes longer or shorter than you thought? What did you hear in the classroom while you were practicing being quiet observers? Part B What's That Sound? Pair kids up and head outside, to one of the locations kids suggested if possible. Bring the poster paper that lists their predictions. When you arrive at your outdoor location, have kids sit in a circle on the ground. 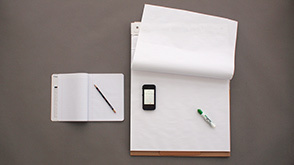 Have them describe or draw your location in their field notebooks. When you say "GO!" they should close their eyes and listen for all the sounds they can hear over two minutes. They should keep their eyes closed and remain quiet until you say "STOP." During this time, they are not writing - they are just listening. When you say "STOP!" they should jot down on their charts all the sounds they have heard. 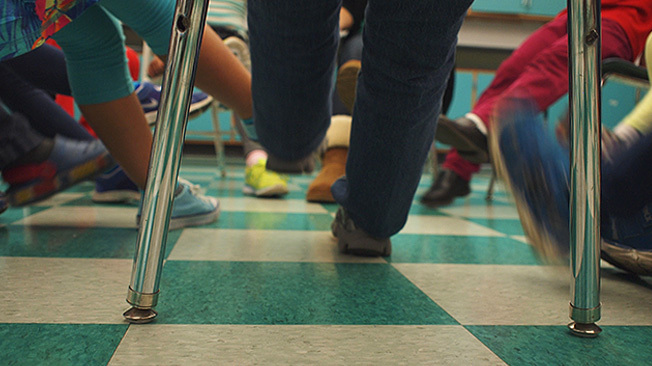 When kids are seated and quiet, say "GO!" and set a timer for two minutes. Say "STOP" after two minutes. Give them a moment to write the sounds they remember. Can you imitate one of the sounds you heard? Was it made by something in nature? Was it made by people? Was it made by something that people have made, such as a car engine or a helicopter? Allow each kid to share an observation. Regroup and walk to another site the kids have suggested. Repeat the activity. Make comparisons between the two sites. Did you hear different kinds of sounds here? What might be some reasons why? Review the predictions you made on the poster paper and have a discussion about sound. Did you hear everything you predicted you would hear? What else did you hear? How might your results be different if you did your Sound Safari at a different time of day? What were the loudest sounds? The softest sounds? Why do animals make sounds? 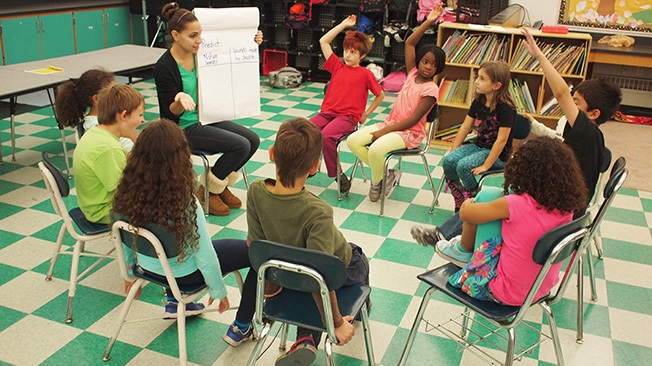 What can we learn about an environment just by listening? For example, do all birds sound the same? What can sounds tell us about the diversity of the environment? How might sounds made by people, such as traffic noises or lawnmowers, affect animals who use sound to communicate? If students do not hear many animal sounds, don't despair! That, in itself, is a conversation starter. Many birds, for example, sing only at dusk and dawn, and are relatively quiet in the heat of the day. Some insects, such as crickets and katydids, make sounds in the evening. You may want to scope out the spots you're thinking of ahead of time to check what types of sounds you can hear at different times of the day. Try this activity at different times of day or different times of year. How are the sounds of nature - and the sounds made by people - different in the morning than at sunset or in the middle of the day? You could also do this activity in different seasons or during different kinds of weather. If it's snowing, bundle up, step outside, and just listen for a few minutes. Is it quiet enough for you to hear the snow falling? Notice how other sounds, such as cars on the road, become muffled when the snow piles up. If it's raining, grab some umbrellas and step outside, just for a few minutes. What does the rain sound like? Are any animals making sounds, or are they all quiet? What's the fun in listening to nature if you don't know what you're listening to? A number of websites and apps help in identifying common bird, insect, mammal, and frog calls. Have a listen to the eastern chipmunk's chirp, the red squirrel's trill, and the eastern gray squirrel's raspy squawk and chatter at Cornell University's Macaulay Library. The University of Florida has recordings of crickets, katydids and other insects you might hear on a summer evening, even in a city. Have you ever heard these calls? Frogs and toads call at the edges of ponds and wetlands. Listen to some common ones, such as spring peepers, American toads or American bullfrogs at the U.S. Geological Survey's Patuxent Wildlife Research Center. Do any of them sound like they're saying "ribbit" or "croak"? Birds, of course, are the most obvious of nature's noisemakers. The Cornell Lab of Ornithology has a comprehensive resource on birdsong.